Woodbridge, United States - December 13, 2018 /MarketersMedia/ — Breaking a sweat is one of the most satisfying things to feel during any sports or fitness activity. Sweating is the body’s way of removing toxins from the body and regulating the body’s temperature. Sweating does not only occur while doing interval training, boxing, or running. It is also possible to break a sweat while partaking in less intense modes of exercise, such as yoga. There are instances wherein there is no available shower room, and only a changing room is available. Moreover, there are yoga sessions during lunch breaks or in between work; there is a pressing need for a product that can help wipe-off sweat without having to step in the shower. There are available no-rinse wipes in the market. However, there are instances wherein these wipes are not enough to meet the needs and requirements of these active and energetic yoga and sports buffs. Surviveware, maker of high-quality camping and hygiene products has created biodegradable wet wipes that can provide immediate hygiene solutions for yoga enthusiasts. The company’s wet wipes are designed to provide maximum comfort during sweaty and tedious workouts without having to break the bank. These wet wipes are made from soft cloth fiber that glides the skin comfortably. Three times larger compared to regular wipes, these no-shower heavy-duty body wipes can clean an average-sized adult body with just one to two wipes. Moreover, the cloth is made from a biodegradable material that will decompose within 28 days. Therefore, users can be assured that they won’t contribute to the trash pile in landfills. These biodegradable wet wipes are formulated to be hypoallergenic and alcohol-free. It has undergone a series of tests to ensure that the product is safe to be used by children, elderly, and people with sensitive skin. Natural aloe and vitamin E is also infused into these wipes. This ensures that each sheet has enough moisture content to moisturize and nourish the skin. Despite its gentle formulation, can still clean remove tough dirt, sweat, and body oil. These wipes can also be used to clean-off yoga mats after each workout. Since the sheets are large and won’t tear easily, it can clean the mat with ease. Yoga moms also don’t need to worry about body odor. These wipes are scent-free which helps keep odor at mum. Moreover, Surviveware’s wet wipes dry nicely on the skin and don’t any sticky residue. This is ideal for keeping one’s body fresh after a workout. Moreover, the wipes are economical. The pack comes in 32 large wipes that can last for several uses. The wet wipes are also loaded with moisture so users won’t have to worry about the sheets drying out. Find out why these wet wipes are perfect for yoga and sports enthusiasts. Try these wet wipes today and do more fun activities without worrying about shower time. 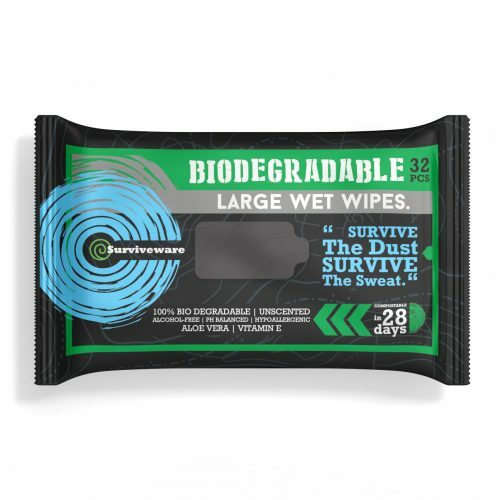 Get your pack of Surviveware Biodegradable Wet Wipes today by clicking here.